Maung Thura “Zarganar” is a popular Burmese comedian, film actor, and film director, as well as a fierce critic and often political prisoner of the Burmese military government. Known for his pointed puns against the military junta, Zarganar, whose name translates to “tweezers,” is widely considered to be the most popular comedian and satirist in Myanmar. He first found success while still in college, performing amateur comedy shows at Yangon’s universities under his stage name Zarganar. With students from various colleges and institutes, he formed the dance-troupe Mya Kyun Tha, and later the drama group Moe Nat Thuza, which performed at student gatherings. 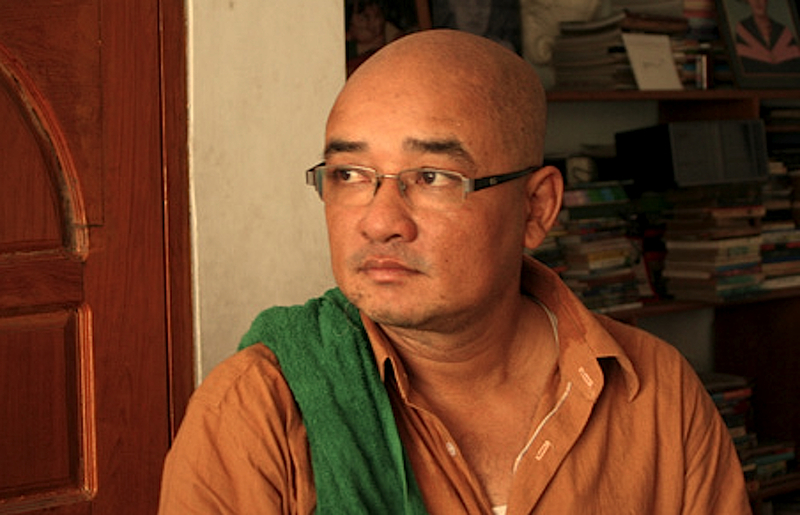 Zarganar became a household name when his troupe started appearing on Burmese television in broadcasts of anyeint shows (traditional Burmese theater). Thura graduated from Yangon’s elite State High School No. 1 Dagon and received a degree in dental surgery from Rangoon Institute of Dental Medicine in 1985. While in dentistry school, he worked as a volunteer literacy teacher in Chin State and wrote about his experiences in a book. After completing his studies, he took to the stage full-time. In 1986, he formed the Mya Ponnama Anyeint troupe whose shows frequently appeared on television. He quickly became known for his expert ability to concoct double entendres. People were drawn to his vaudevillian routines filled with seemingly innocent silly banter among comedians not only because they were bitingly funny but also because they cleverly highlighted the failures of the government. By using humor to push the envelope against censors, his anyeint shows generated immense interest among Burmese of all backgrounds, and in the process attracted new generations of fans to anyeint shows. Though he did not invent the art of puns and double entendres, which had long been part of traditional Burmese culture, he revitalized and perfected it. That all changed in 1988. During the uprising, Zarganar was arrested for being an “instigator” and sent to the notorious Insein prison for a year. He was arrested again during the 1990 elections for giving political speeches and sentenced to another four years in prison. (His father, also a political activist, at one point gave a speech at the home of Aung San Suu Kyi, leading to a ban by the state censors.) In 1991, the Human Rights Watch organization awarded him a Lillian Hellman and Dashiell Hammett Grant. After his release in 1994, Zarganar was prohibited from performing on stage but allowed to participate in video productions, working as producer, director, screenwriter and actor. However, his work was closely scrutinized by the censors and military intelligence, in a cat-and-mouse game in which Zarganar and his audiences took delight in sidestepping the authorities. In 1997, Zarganar ran afoul with the authorities for his movie Lun, and was banned from show business for another three years. He was allowed to make films in 2000 (but still no comedy shows or stage theater). In May 2006, Zarganar was again banned from show business indefinitely after giving an interview to the BBC. In September 2007, Zarganar was arrested at his home for his participation in antigovernment protests. During the preceding two days he had, with fellow Burmese celebrity Kyaw Thu, publicly delivered food and water to Buddhist monks preparing to protest. He also had urged the public to support the monks in radio interviews from outside the country. Soon after Cyclone Nargis devastated vast swaths of the Irrawaddy delta in early May 2008, Zarganar organized a group of 400 Burmese entertainers to provide volunteer disaster relief aid in the cyclone-ravaged areas. He divided the volunteers into groups of helpers, who brought aid to 42 villages, some of which had until then received no help at all. He was arrested on June 4 for speaking to foreign media about the millions of people left homeless. Amnesty International named him a prisoner of conscience and called for his immediate release. In November 2008, he was sentenced to 59 years in prison, which were later reduced to 35 years. In December 2008, Zarganar was sent to Myitkyina Prison in Kachin State in the country’s far north, from which he was freed on 11 October 2011 in a mass amnesty of political prisoners. Since then he has campaigned with indomitable spirit for the rights of Burmese people, traveling worldwide, meeting with foreign ministers and supporting the political transition as Myanmar takes its first steps towards democracy. In February 2012, he travelled to Washington, DC to meet US Secretary of State Hillary Clinton and discuss the ongoing issues of political prisoners, women’s rights, and the situation of ethnic minorities in his country. Zarganar has received numerous awards, including the Freedom to Create Prize for Imprisoned Artists, the One Humanity Award by PEN Canada, and the inaugural PEN/Pinter Prize as an International writer of courage. Zarganar has been involved with the film industry for many years. Between 1985 and 1988, he starred in four films and eight video movies as the lead actor. He took on supporting actor roles in his movies from 2001 on. He also tried his hand at directing. In 2004, with the aid of local non-governmental organisations, he directed three short videos and a film for the purpose of raising awareness of HIV and AIDS in the country. He is also the founder of H.O.M.E. (Home of Media and Entertainment) to help develop new talent in his country and to promote the arts. Zarganar has been featured in This Prison Where I Live, a documentary film by British filmmaker Rex Bloomstein and German comedian Michael Mittermeier, who had traveled secretly to Burma to make the film.